COME TO NORTHWINDS FOR A SUCCESSFUL HUNT! 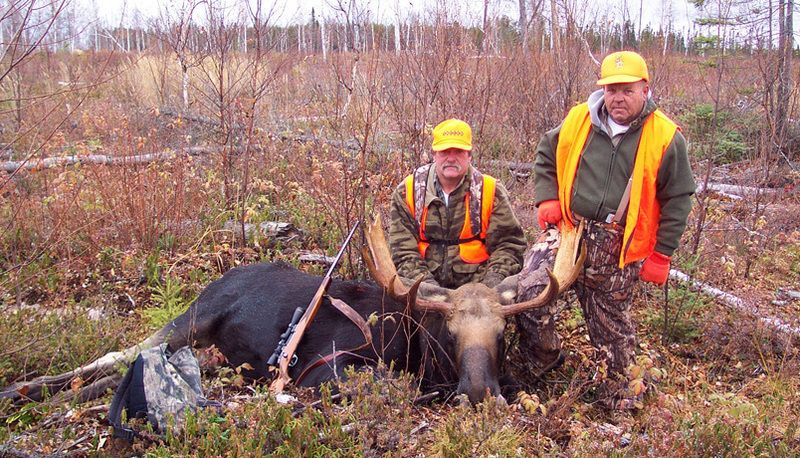 We offer 3 types of Moose Hunts at Northwinds! This hunt is further north and involves staying in a tent that is fully outfitted with everything you need. This hunt is more adventurous as you are living out in the woods. Hunting at the tent camp is mainly done in forestry cut-overs with ATVs and 4×4 trucks. This hunt is mainly done from boats along rivers and lakes. This hunt includes canins to stay in as well as meals cooked by Mom. This hunt is great for those who don’t want to rough it. For the do-it-yourself hunter, our moose areas can’t be matched. We will put you in remote areas with good populations of moose and you do the rest. We can even set up a tent camp for you! We pride ourselves on being the most successful outfitter in our area. Our hunts include everything – accommodations, guides, tags, licences, food, transportation from Pine Grove, gas, etc. At Northwinds you show up with your hunting equipment and we will do the rest. There are no hidden fees. Our Guides have been moose hunting and guiding for a combined 50 years and both of them know their craft. This is the key to success – a great guide means a great hunt.